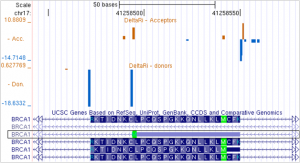 NGS produces thousands of variants per run. Our software hones in on the very limited number that likely alter mRNA splicing. 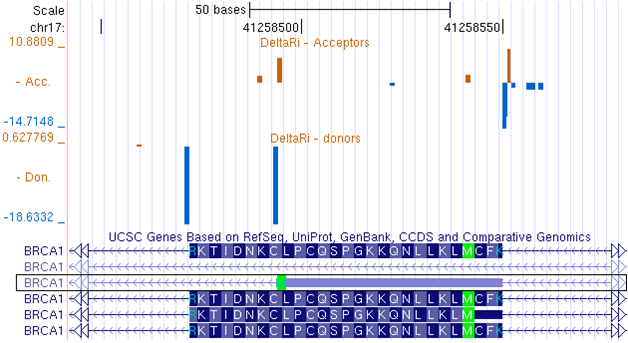 Variants are categorized by whether they fully or partially inactivate natural splice sites or activate cryptic sites proximate to exons or within them. Results for genome-wide, high throughput sequence data are usually obtained in less than 2 hours. The pipeline uses our patented and proven information theory-based binding site analysis. The algorithm has been validated in numerous peer reviewed studies of splicing mutations. The Automated Splice Site Analysis system, the predecessor to the Shannon pipeline has been recommended for use in interpretation of rare variants by the American College of Medical Genetics and Genomics in their published guidelines and standards (Genet. Med. 7, 571–583). The FDA has determined that this software is a medical device under Section 513(g) of the US Federal, Food, Drug and Cosmetic Act, however, it is not yet approved for diagnostic use. The Shannon pipeline is covered by US Patent No. 5,867,402. The Shannon splicing mutation pipeline is covered by US Patent 5867402 and patents pending. Written by: Peter Rogan on August 11, 2012.on February 11, 2017. Posted in and tagged mRNA splicing, mutation, next generation sequencing.